Postcard perfect Siasconset, a village located on Nantucket just a ferry hop from Massachusetts. 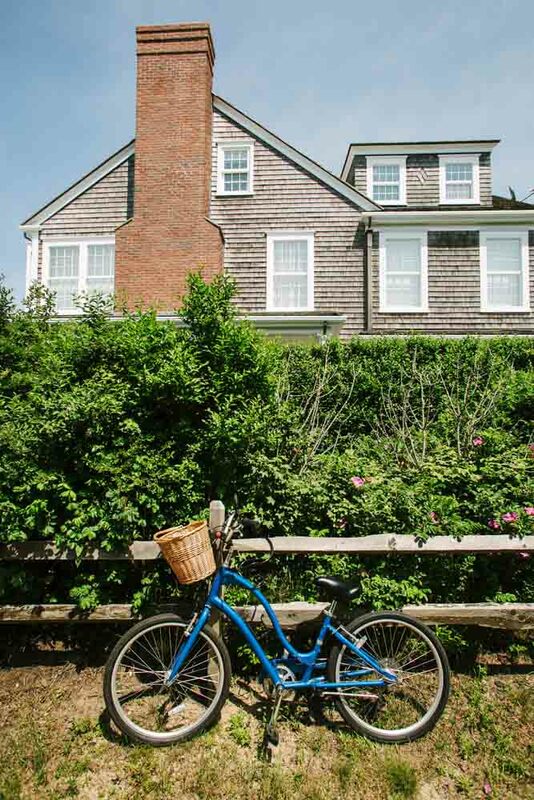 Cycling is a great way to get around Nantucket, Massachusetts. 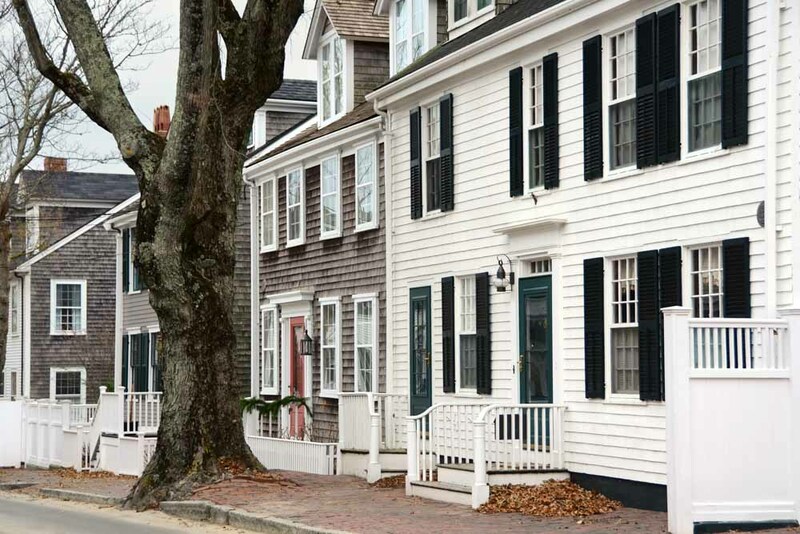 Nantucket’s genteel streets were built on the wealth of the old whaling industry. 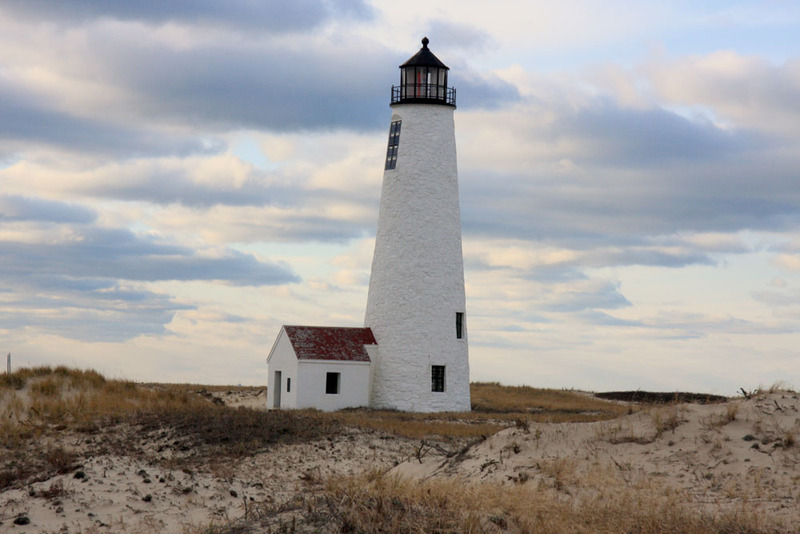 Sankaty Head Lighthouse was built on Nantucket in 1850. 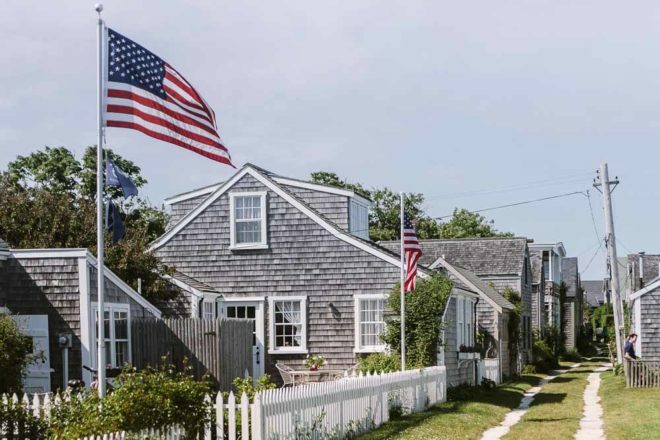 A Nantucket beachside retreat looks out to the roiling Atlantic. 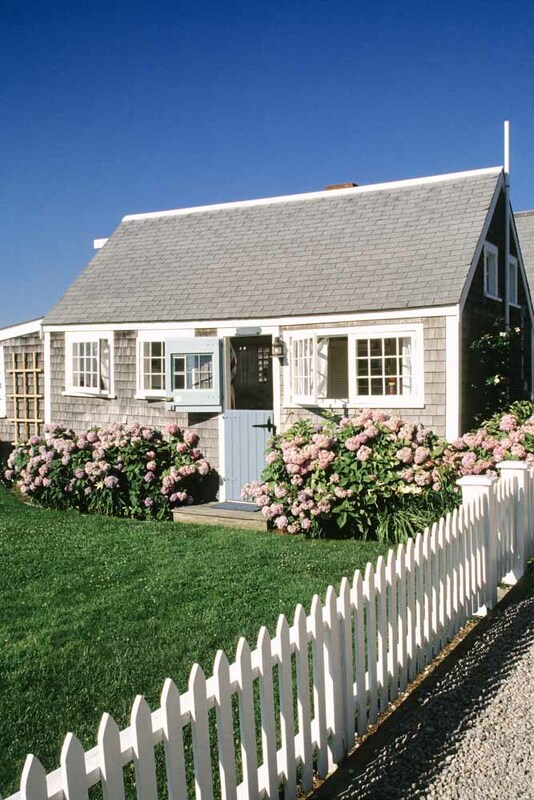 A typically quaint Nantucket fisherman’s cottage. 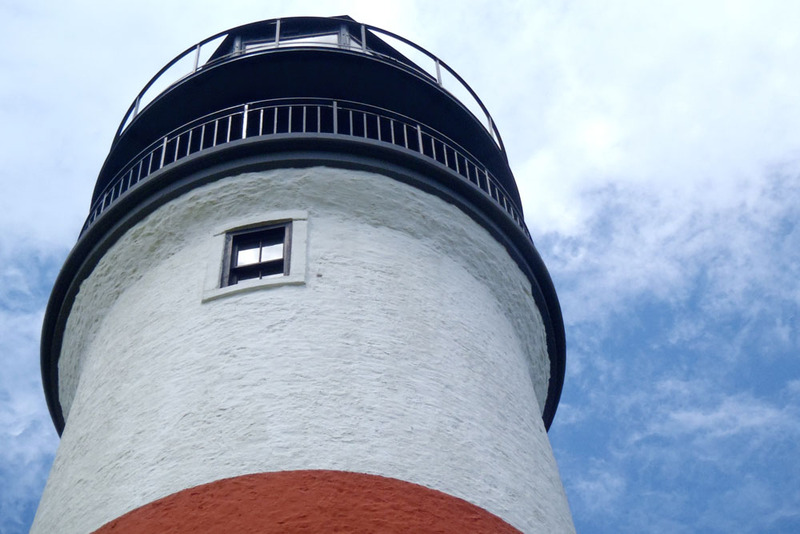 Take a fascinating walk through Coskata-Coatue Wildlife Refuge to Great Point Lighthouse. Nantucket, USA. 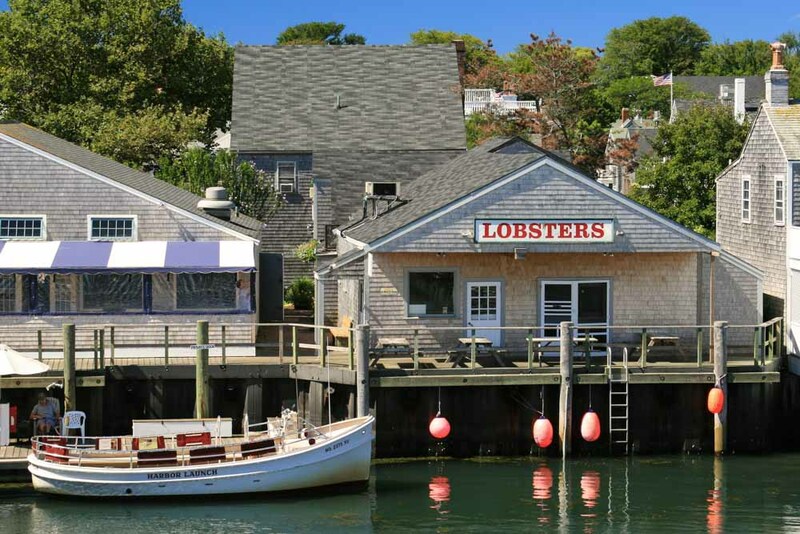 A charming lobster restaurant right on the harbour of Nantucket Island, Massachusetts. 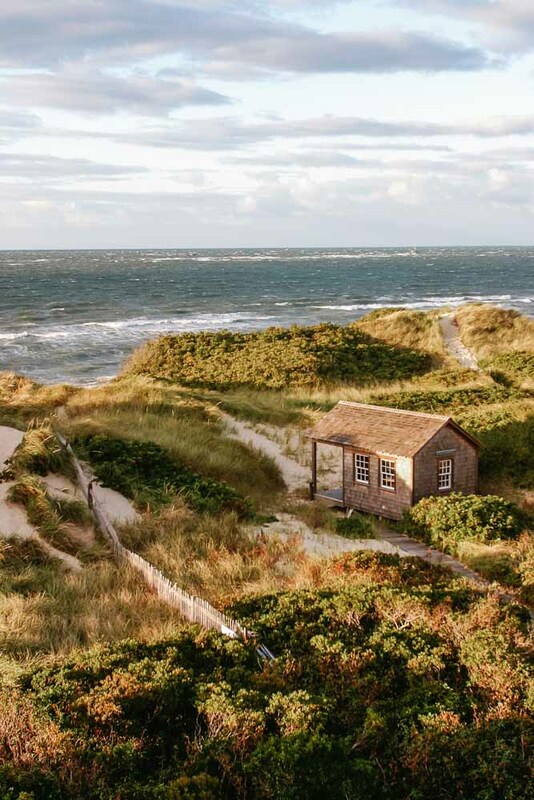 A curious mix of whaling history, old-world inns and forward-thinking locals, Nantucket is an essential ferry hop from Massachusetts. “Nantucket reds get better with age,” says Greg Murray, a fourth-generation Nantucketer. Wine? Roses? It could be either but that would be way too predictable for this dot in the Atlantic, 50 kilometres off the coast of Cape Cod. Instead of vinos, I’m in Murray’s Toggery Shop in Main Street surrounded by chinos. Hundreds of pairs, all the same salmony pinkish colour. Years ago Murray’s great grandfather created the ‘made to fade’ pants to use up sailcloth. They took off and have become quintessential Nantucket. “A person wearing Nantucket reds shows they really get Nantucket,” Murray explains. I hand over the cash for a pair and hope in four days I ‘get Nantucket’ too. Nantucket was originally settled by the Wampanoag people (Nantucket means ‘faraway island’), who sold it in 1659 for ‘30 pounds sterling and two beaver hats’ to a group of English Quakers. Not a bad investment for 124 square kilometres of what is now some of the USA’s most expensive real estate, oozing charm and history. ‘Call me Ishmael’: feeling like an ant under the skeleton of a 14-metre sperm whale in the Whaling Museum puts the famous literary line into perspective. Through the 1700s and early 1800s Nantucket’s ‘greasy luck’ hauled in whales to produce lamp oil that lit New York and London. As I explore the museum, the ill fate of one whale ship, the Essex, unfolds in a series of chilling interactive displays. The whaling days are long gone, however wandering around Nantucket is like being in a time warp. Fragrant roses and honeysuckle replace the stench of whale oil, but the cute-as-a-button grey shingled houses, emporiums and artists’ galleries lining the cobbled streets are still original. There are no neon signs, traffic lights or chain stores, and with strict building codes (right down to the colour of the front doors) the residents intend to keep it that way. It’s also what attracts celebrities, politicians and CEOs who pay up to $20 million for a holiday home to escape to here for ‘the season’. A low-key lifestyle where one day blurs into the next, bumper stickers on cars say ‘20 plenty’ (as in miles per hour), and the only decision to make is where to eat and which beach to loll around on. I feel like I’m starting to ‘get’ this place. With a beach for every occasion they’re either wild or tame: Jetties, 40th Pole, Brant Point and Children’s beaches are perfect for pottering around in calm water and building sandcastles; Nobadeer and Madequecham are for body surfers; Siasconset and Cisco, serious surfers only; Pocomo to windsurf and sea kayak; Sesachacha Pond for nature lovers; Tom Nevers for surf fishing; Steps and Ladies to mingle with the rich and famous; and see the sun rise at Sankaty Head or set over Madaket. Staying for a couple of nights 12 kilometres from downtown, I have the best of both the ocean and bay. Tucked into the sand dunes, The Wauwinet is a gorgeous rambling country house, a tea-on-the-lawn, cocktails-in-the-library, dinner-at-eight kind of place. My cosy antiques-filled room overlooks the protected waters of Nantucket Sound with the Atlantic roaring in the background. I walk barefoot along the ocean beach as slivers of pink light caress the crests of waves, and then kayak the still water of the Sound. One afternoon I borrow a bike and ride a few kilometres along the bike path to the calendar-bait village of Siasconset. The climbing rose-covered fishermen’s cottages attract a steady flow of romantics and photographers. Pushing into the wind along the headland I breathe in the heady mix of salt and rose perfume and ride to the most easterly point of the island, and the ‘lucky to still be here’ Sankaty Head Light. Established in 1850 and with erosion at a rate of one metre per year, in 2007 a delicate 10-day operation shifted the massive red and white lighthouse 120 metres inland. Another morning I take a 4WD tour through the Coskata-Coatue Wildlife Refuge to Great Point Lighthouse. Bob, a strong seafaring washashore manoeuvres the vehicle through heavy sandy tracks past untouched stretches of beach where seals bask in the sunshine. It’s the breeding season for the protected rare piping plover birds, so instead of walking to the lighthouse we admire it from afar and revel in the isolation. The following day I move to ‘town’ to feel the vibe of high season. With the population swelling from 10,000 permanents to 50,000 over the summer, beautifully restored inns and boutique hotels are dotted along the cobbled streets. Inns like The Brass Lantern, Seven Sea Street, Jared Coffin House, and Regatta evoke classic Nantucket with secrets of bygone days hidden in the walls and creaking floors. Attracted to the unusual name, I settle into the understated poshness of the grand dame of all inns – the White Elephant Village. And the location couldn’t be better. I can walk to the harbour to ogle the mega yachts and meander through the one-of-a-kind quirky shops. As an added bonus, The Juice Bar is nearby. Here I develop an addiction not for the juices, but the house-made ice-cream, especially the Crantucket flavour: vanilla with local cranberries and chocolate chips. Like the ice-cream, the island’s foodie scene is creative. With as many restaurants and cafes as beaches, I befriend locals to find the best hang-outs: Something Natural to picnic on lobster sandwiches filled with chunks of meat the size of 50-cent pieces; Cru on the waterfront for plump freshly shucked oysters; The SeaGrille’s bouillabaisse; and Topper’s at The Wauwinet for everything. One evening I head to India Street with the names of more must-dos. It’s early but the queue outside Black-Eyed Susan’s, a tiny, no-reservations Nantucket institution, tells me breakfast is a better option. However, ‘greasy luck’ is on my side at Company of the Cauldron, where chef and owners All and Andrea Kovalencik squeeze me into their ivy-covered, wooden-beamed 40-seat prix fixe restaurant. The food is art. Asparagus and lobster crêpe with curry sauce, Tuscan-grilled rib-eye steak rubbed with rosemary and pepper. Despite vowing never to eat again after the previous night’s dinner, I manage a breakfast at Black-Eyed Susan’s the next morning. In fact, at 7am I’m the first through the door. Perched at the old-fashioned bar under a rose and green glass chandelier I watch the chef cook up my Spicy Thai Scramble with curry, broccoli, potatoes and coriander, with cheese grits on the side. By the time I finish savouring every mouthful there’s a queue outside. Although four days only scratches the surface, I do feel like I ‘get Nantucket’ enough now to wear my reds with pride. Getting there: Cape Airlines has a small plane shuttle service from Boston to Nantucket (45 minutes, priced from $520 return). There’s a slow (2 hours 15 minutes) and fast (1 hour) ferry service from Hyannis, a 114-kilometre drive from Boston. Playing there: A two-hour walking tour leaves from the Whaling Museum where a guide reads excerpts from the non-fiction book In the Heart of the Sea by Nathaniel Philbrick to show you each historic spot through the eyes of Captain Pollard and the crew of the Essex.